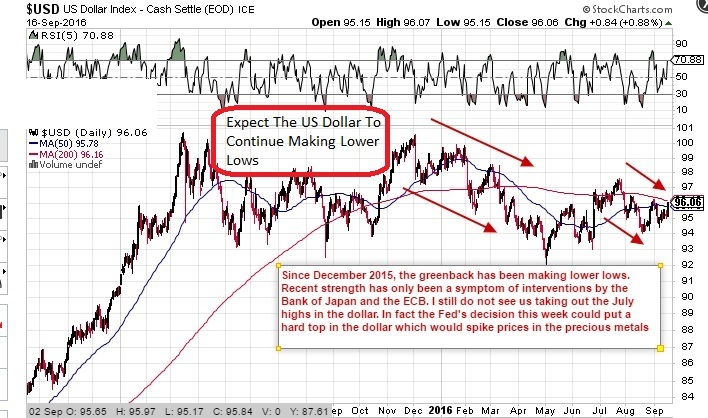 Will A Non-Hike From The Fed Tank The Dollar? I cant see the FED hiking this week. We have had dollar (NYSEARCA:UUP) strength as of late due to interventions from the BOJ & ECB but I view these as temporary. Why? Because the Fed really wants a weaker dollar. It is the only way it can inflate away its debts. Look at things this way. A stronger dollar means that the US national debt is humongous. Remember all those bonds have to pay out dollars. Therefore it is the best interest of the FED to have a weak dollar so these “debts” can in some way be inflated away.. This entry was posted in Recommendations and tagged (NYSEARCA:UUP). Bookmark the permalink.